SynthScaper has excellent possibilities to create spatial effects from plain or mono samples. This app has several ways for auto moving voices over the panorama as well as effects that have stereo imaging functions. This example shows how to create a complete instrument with bright and continuously changing spatial sound from the one mono sample. 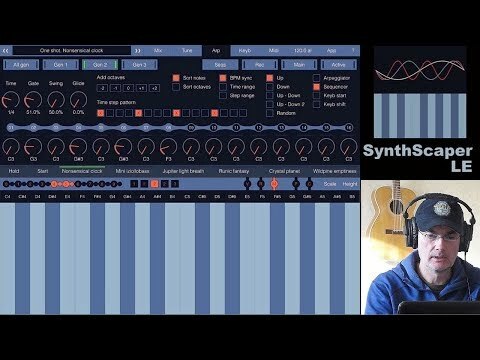 Also in this example will be used a very interesting feature "Natural chorus" which can automatically pan several voices (each oscillator in Synthscaper has six voices) when they appear and disappear. The best way to start creating a new instrument is to use the initial settings of all parameters to make the oscillator work in simple mode, and no any settings affect it. The special scene "Empty scene" sets the initial values of all parameters. In this scene oscillators 1 and 3 are muted, and for oscillator 2 is used only first layer with sine waveform. Filters, Envelopes and LFOs are not assigned (except for the base Envelope generator for the "Level" parameter). From the list of scenes select "Empty scene" to set all parameters to initial values. - On the main screen tap on area at the top with name of current scene. - From the main list of scenes select "Empty scene". If the list is show content one of scenes group, tap the button "Back" above the list to go to the main list. - Tap the button "Set" below to set the empty scene. - Close the list by button "Close". You need set the same sample for all three layers. 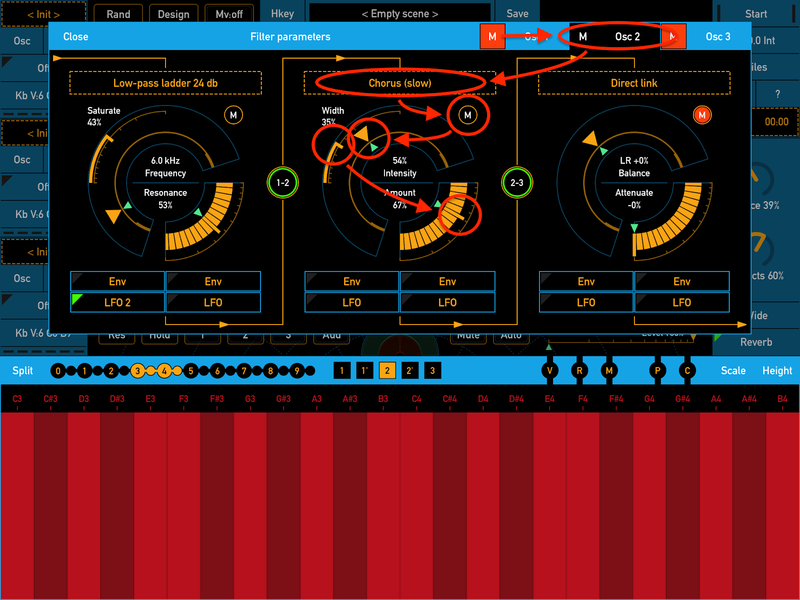 - On the main screen, tap button "Osc" on the left panel in the area of oscillator 2 (in the middle of the left panel) to open the panel "Oscillator parameters". - Tap the button "Layer all" to select a mode in which changing any parameter will apply to all layers (but only when you change parameter). Also in this mode the selected sample will be assigned to all layers. 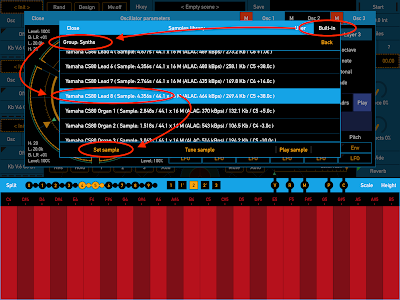 - Tap the dashed area below to open the panel "Samples library" where you can select and set the sample for the current oscillator and all layers (or the current layer if you select specific layer). - In the panel "Samples library" you need select the sample from built-in library. At the title of panel tap the button "Built-in" to switch on the list of built-in library. If you need select the sample downloaded to this app use the button "User" to switching to the user library. - Select the sample that will have bright and noticeable sound when it uses in the multi-layered instrument. For this example select the sample "Yamaha CS80 Lead 8" from the group "Synths". If you want to select another group tap the button "Back" at the top right to go to the main list. In the main list you can select another group. 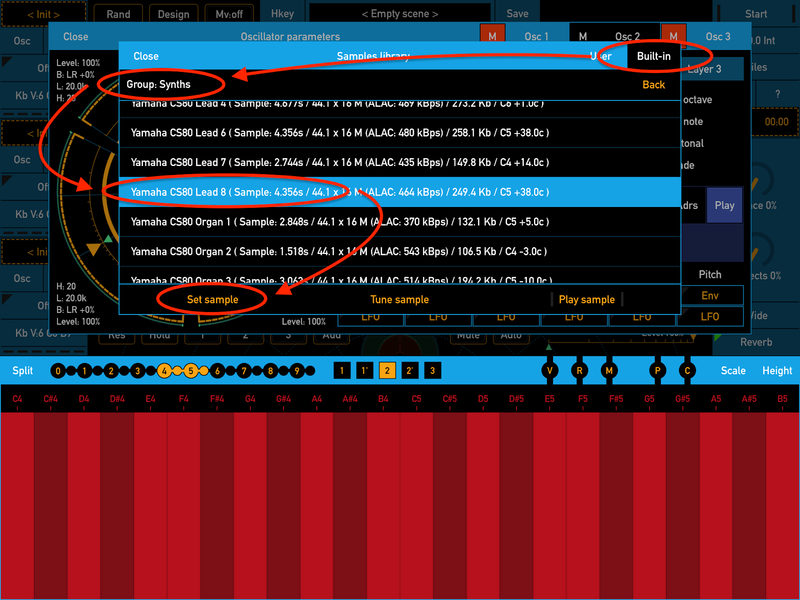 - Tap the button "Set sample" to set the selected sample for all layers of oscillator 2. 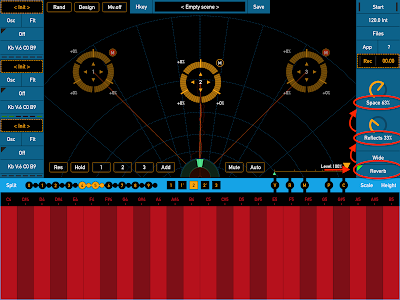 When you finish creating a new instrument with this example, you can try to select other samples and listen to their sound with the same settings. One of the easiest ways to make the sound of a single sample brighter is to shift the tone for different layers. For example you can shift the one octave up and one octave down for layers 2 and 3. Layer 1 remains not shifted. Also you can shift the cents from "3" to "7" (or even more), up or down for these layers. It gives more harmonics and more interesting sound. - In the panel "Oscillator parameters" tap the button "Layer 2" and set value of the knob "Octave" to "-1". Also set "Cents" to "-5". For the "Layer 3" set "Octave" to "+1" and "Cents" to "+7". Try playing some notes or chords and listen to the result. Try to set another value of shift "Cents" for different layers. In the next step we will add the first spatial effect "Natural chorus". This effect will change the panorama of voices (i.e. move voices left or right) when the voice appears and disappears. First voice (when you press single key) appears on center. The next voices (when you press and hold down several keys) will move already sounding voices farther from the center to left and right, and new voice will placed to the center. When you release the keys the voices will move closer to the center. The parameter "Width" defines the maximum value of panorama for all voices. Value "100%" means that all 6 voices will placed between "100% left" to "100% right". The parameter "Time" defines the time for which the voices reach their final positions. The more this value, the more smoothly the voices will move when you press or release the keys. For this example we will set the same value of parameters "Width" and "Time" for all layers. But you can try set the different values for different layers. For example set less value of "Width" for low tones and higher value for high tones. You will get even more complex spatial effect. Or come up with any other options. - In the panel "Oscillator parameters" tap the button "Layer all" and tap the button "Play" in the center area. Set value of "Width" about to "35%" and "Time" about to "0.3s". Try to press and hold several keys one by one slowly. Listen to the result. It is best to use headphones. The envelope generator (or ADSR) assigned to the parameter "Level" greatly influences to the character of the oscillator sound. By default in empty scene the envelope generator 1 with default settings already assigned to the parameter "Level" for all layers. - In the panel "Oscillator parameters" select "Layer all" and tap the button "Env" below title "Level". - In the panel "Envelope parameters" make sure that the envelope generator 1 is selected and assigned to parameter "Level" for all layers. 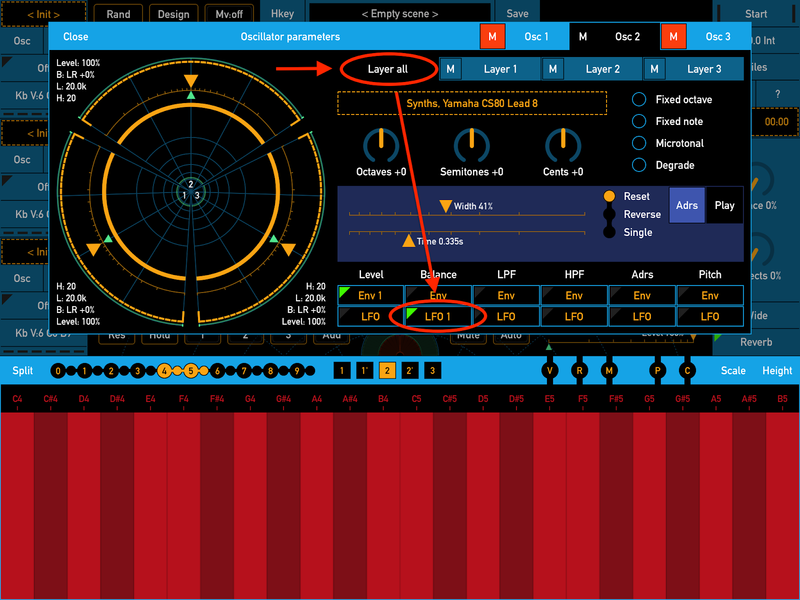 The button "Assign" has green marks and title above parameter knob should indicate that it is parameter "Level", for all layers ("La") of oscillator 2 ("O2"). - Tap the button "Default" several times to select one of default envelopes. - Set values of the knobs "Attack" to about "0.45s", "Decay" - "0.16s", "Sustain" - "88%", "Release" - "1.77s". 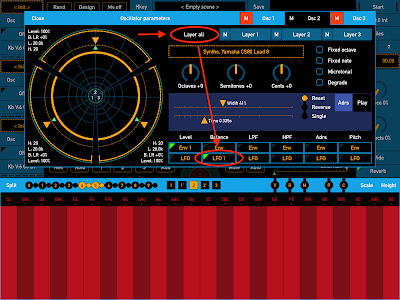 You can change the envelope for the parameter "Level" to make the sound smoother or sharper. Use a longer attack time and longer release time to build beautiful pads. Or set the attack and release time to small values to get a staccato sound. Another interesting spatial effect can be reached by assign LFO to the parameter "Balance". Unlike the effect "Natural chorus" which change panorama (or "Balance") for voices, this method will change panorama for layers and can be very noticeable when you use different samples for different layers. But even with the same sample for all layers this effect will give additional variations to the sound. You can combine both of these effects or use only one. 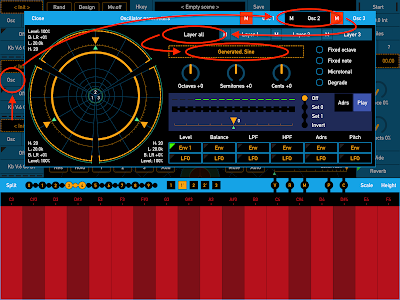 - In the panel "Oscillator parameters" select "Layer all" and tap the button "LFO" below title "Balance". - In the panel "LFO / Effect parameters" make sure that the low-frequency oscillator 1 is selected and assigned to parameter "Balance" for all layers. The button "Assign" has green marks and title above parameter knob should indicate that it is parameter "Balance" for all layers ("La") of oscillator 2 ("O2"). - Set the modes of LFO - "Sine" waveform, "Random" mode and "Keyboard sync". - Set value of the knob "Delay" to about "0.55s". This knob has effect only when you set the mode "Keyboard sync". This parameter will delay starts of LFO on specified time when the first key is pressed. - Set value of the knob "Rate" to about "3.7s" and the knob "Depth" to about "50%". These parameters define work of whole LFO. But you can specified in which range this LFO will changing the destination parameter. - Set value of the knob "Range" to about "36%". This parameter defines in which range LFO will changing the destination parameter "Balance". Two graphs on this panel show changing LFO waveform (brown) and changing of destination parameter (green). For more advanced effect set the parameter "Phase shift" in LFO for different layers. You can use this trick not only for changing parameter "Balance" but also in any other cases when you assign the same LFO for all layers or for different parameters. 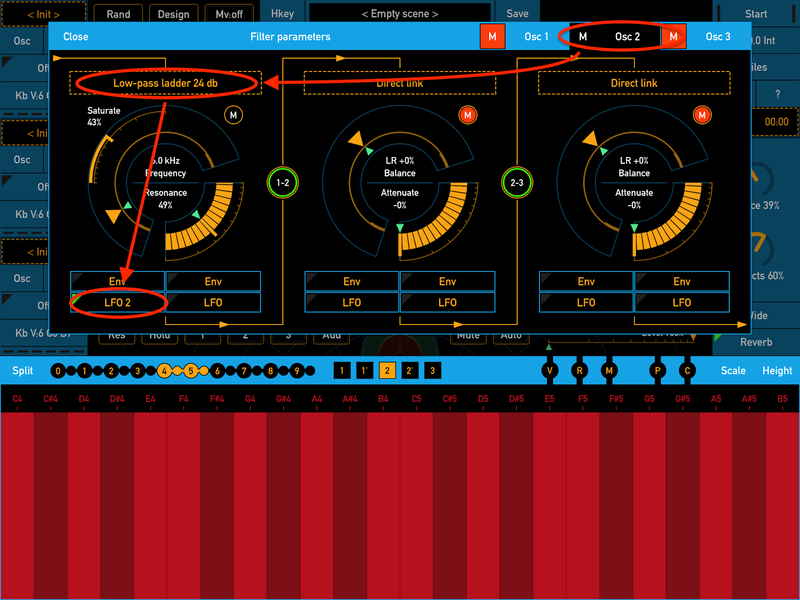 - In the panel "Oscillator parameters" tap the button "Layer 2" and then tap the button "LFO" below the title "Balance". After you set parameters of LFO for layer 2, tap the button "Layer 3" and set LFO parameters for this layer. - In the panel "LFO / Effect parameters" make sure that LFO 1 is selected and assigned to parameter "Balance" for layer 2. The button "Assign" has green marks and title of the knob below this button should indicate that it is parameter "Balance" for layer 2 ("L2") of oscillator 2 ("O2"). It is the same parameter that on "Oscillator parameters" panel. - Set value of the knob "Phase" to about "+18" for layer 2. Then for layer 3 set this value about "+47". In result the parameter "Balance" for all layers will varying with the same rate and depth but will have differ value for each layer due to phase shift. This trick adds very interesting spatial variations. A low-pass filter (LPF) removes high frequencies from a tone. It makes the tone sound more mellow or muted. The parameter "Frequency" defines cutoff frequency. The lower the parameter "Frequency", the more muted the tone sounds. The parameter "Resonance" boosts the overtones near the cutoff frequency. The parameter "Saturate" adds more harmonics to the signal. The best way is to make this filter controlled by the vertical slide on screen keyboard or by modulation wheel on MIDI controller. Or make continuously changing it with using LFO. Or both of these ways. In this example we will assign LFO for this filter. - On the main screen, tap button "Flt" on the left panel in the area of oscillator 2 (in the middle of the left panel) to open the panel "Filter parameters". - Tap the dashed area of first slot (the most left) to open the list of filters and effects. In this list select "Low-pass ladder 24 db", then tap the button "Set" to set this filter for the first slot. - Tap the button "M" at the top right of the first slot to unmute this slot. - Set values of parameters "Saturate" to about "43%", "Frequency" about "6 kHz" and "Resonance" about "49%". 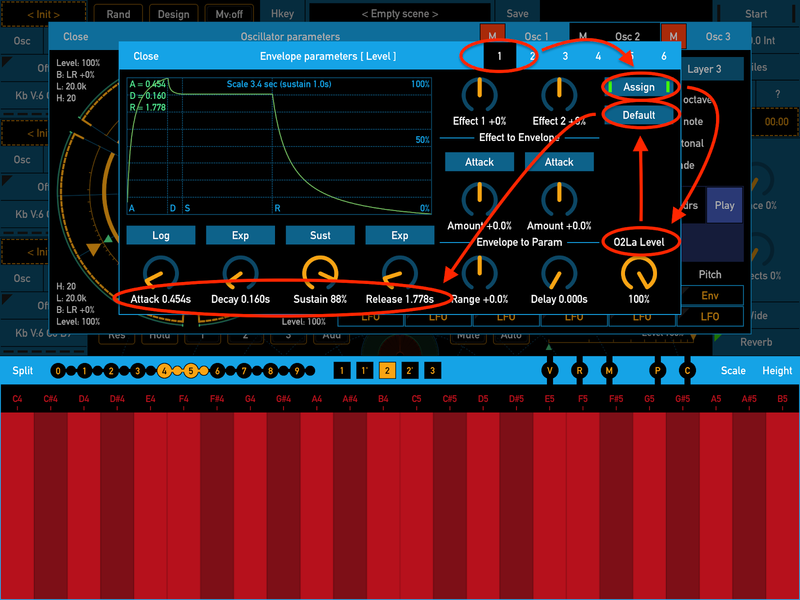 In this example LFO will constantly change the parameter "Frequency" of low-pass filter. 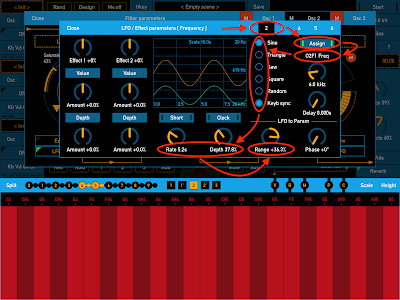 You should to use LFO 2 because LFO 1 already used for changing the oscillator parameter "Balance". - In the panel of "Filter parameters" make sure that the layer 2 is selected and the first slot has the filter "Low-pass ladder 24 db". 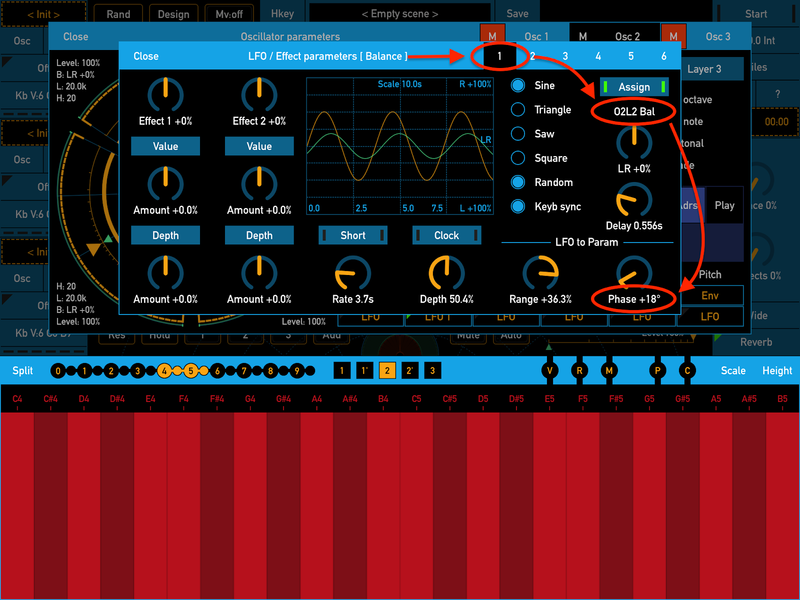 - Tap the button "LFO" below the first parameter of filter. When you first time will set this filter no any LFO not assigned on it. - In the panel "LFO / Effect parameters" select LFO 2, then tap the button "Assign" to assign this LFO to the first parameter of filter. This button will have green marks and LFO number will be indicated in the button title on "Filter parameters" panel. - The knob below the button "Assign" will have the title indicates that LFO was assigned for the first parameter ("Frequency") for filter 1 ("L2") of oscillator 2 ("O2"). It is the same parameter that on "Filter parameters" panel. 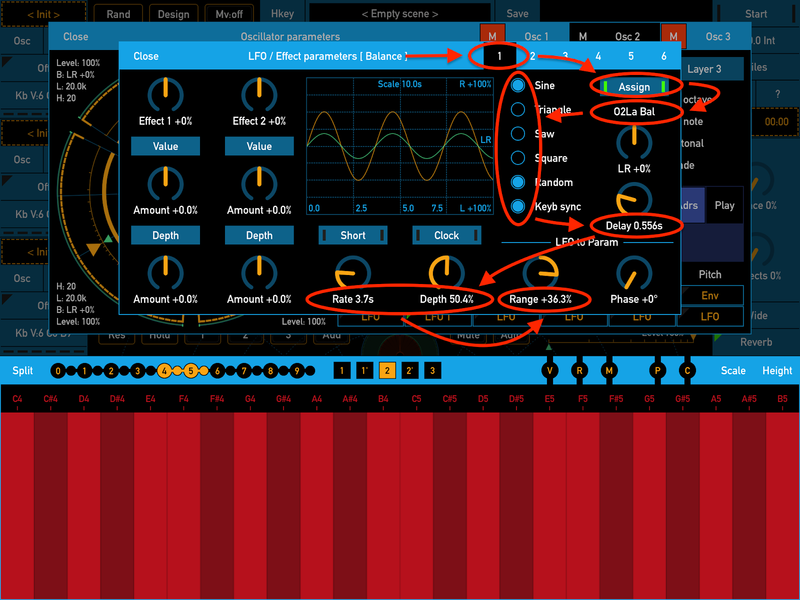 - Set the modes of LFO - "Sine" waveform and "Keyboard sync". Parameter "Keyboard sync" will sync starts of LFO when the first key is pressed. - Set value of the knob "Rate" to about "5.2s" and knob "Depth" to about "37%". These parameters define work of whole LFO. But you can specified in which range this LFO will changing the destination parameter. - Set value of the knob "Range" to about "36%". This parameter defines in which range LFO will changing the destination parameter "Frequency". Two graphs on this panel show changing LFO waveform (brown) and changing of destination parameter (green). The effect "Chorus" can make any sound rich, lush and coloring. If you use mono sample and don't use any spatial effects with oscillator this effect can add stereo width to the oscillator sound. 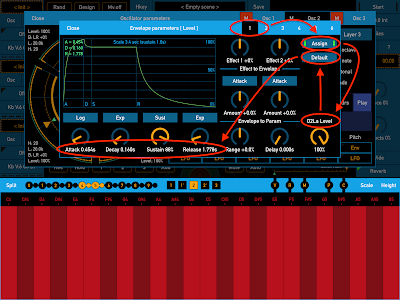 But even with use spatial effects in oscillator the effect "Chorus" will fit great. The parameter "Amount" defines the ratio between the original signal and the signal after "Chorus" effect. The parameter "Intensity" defines level of variations in this effect. The parameter "Width" defines stereo width of this effect. - In the panel of "Filter parameters" make sure that the layer 2 is selected, and then tap to the dashed area of second slot (in the middle) to open the list of filters and effects. 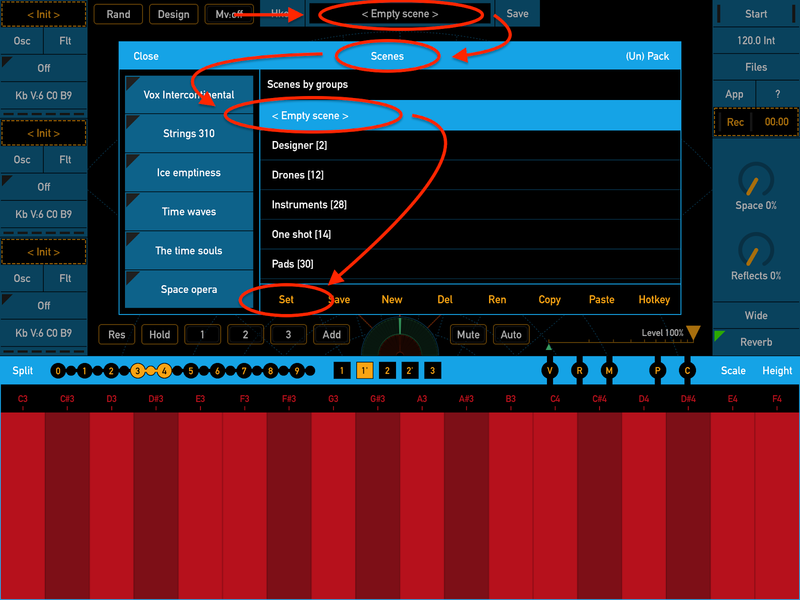 In this list select "Chorus (slow)", then tap the button "Set" to set this effect for the second slot. - Tap the button "M" at the top right of the second slot to unmute this slot. - Set values of parameters "Intensity" to about "54%", "Width" about "35%" and "Amount" about "67%". You can try to replace this effect to "Chorus (fast)" and choose the one that seems more fit for you. Finally complete your scene with a reverb. - On the main screen make sure that reverb / spatial mixer is on. The button "Reverb" at the bottom right has green mark. - Set value of the knob "Reflects" to about "33%" and knob "Space" about "63%". - Move the ring control of oscillator 2 (control with number 2 at the center) slightly down. You can turn off the reverb / spatial mixer. 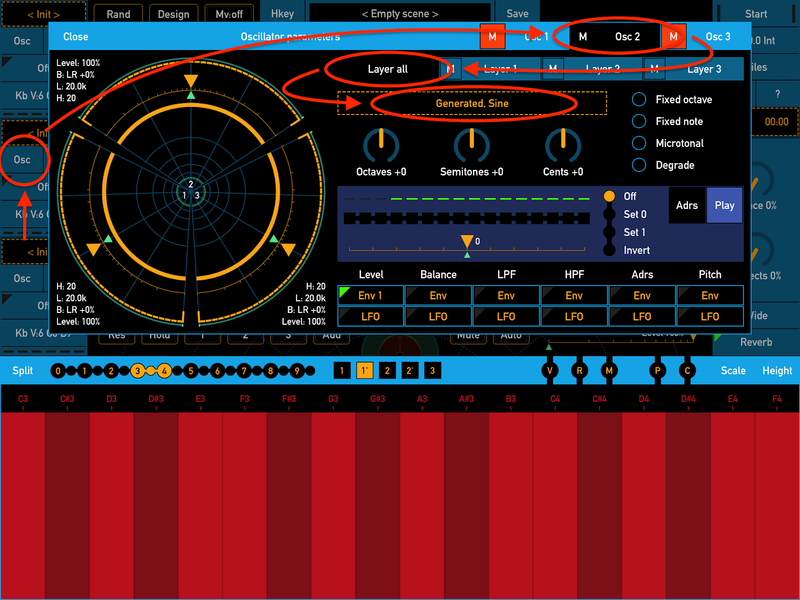 In this case when you move oscillator control on the spatial mixer area it will just change output level (close - far) and panorama (left - right). When the reverb is turned on the position of ring control defines the position of sound source (oscillator output) in the sound space. The bottom center point of the spatial mixer closest to the listener. Moving the control element further from the bottom center point distances sound of oscillator away from the listener. Moving the control element to the left or right moves the sound in space also to the left or right, but taking into account the distance to it. The parameter "Space" defines relative size of reverb space. The parameter "Reflects" defines amount of reflections from the boundaries of the reverb space. 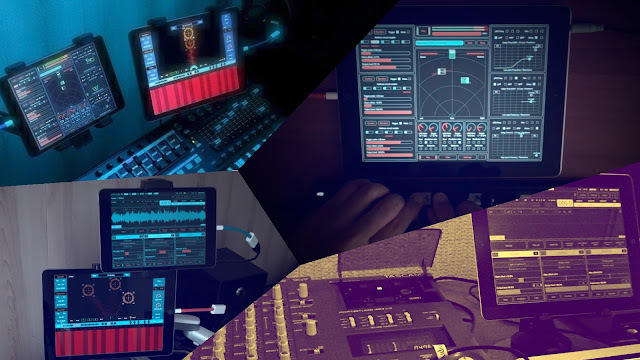 The SynthScaper is just created for various experiments with sound. 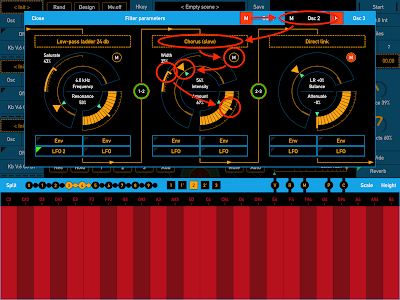 Feel free to try new ways of configure this app and you will be able to get a more interesting result than with any other synths. 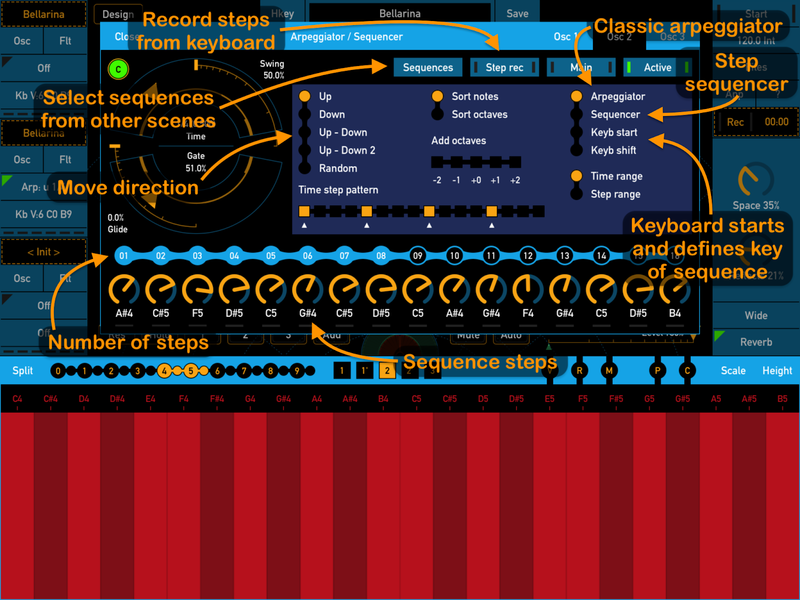 SynthScaper - Soundscapes synthesizer for iPad and iPhone ver. 1.5 has been released. 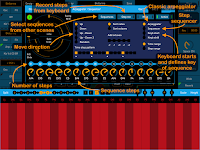 In this update added an advanced arpeggiator / sequencer for each oscillator with modes where the keyboard can start the sequence and shift it depending on the key. Also, you can record sequence steps using screen or MIDI keyboard or select sequences from other scenes. 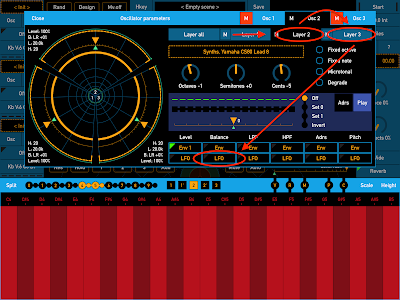 The start and tempo of the sequence can be synchronized with Ableton Link, Inter-App audio or with external MIDI devices. Own sequencer / arpeggiator for each oscillator. 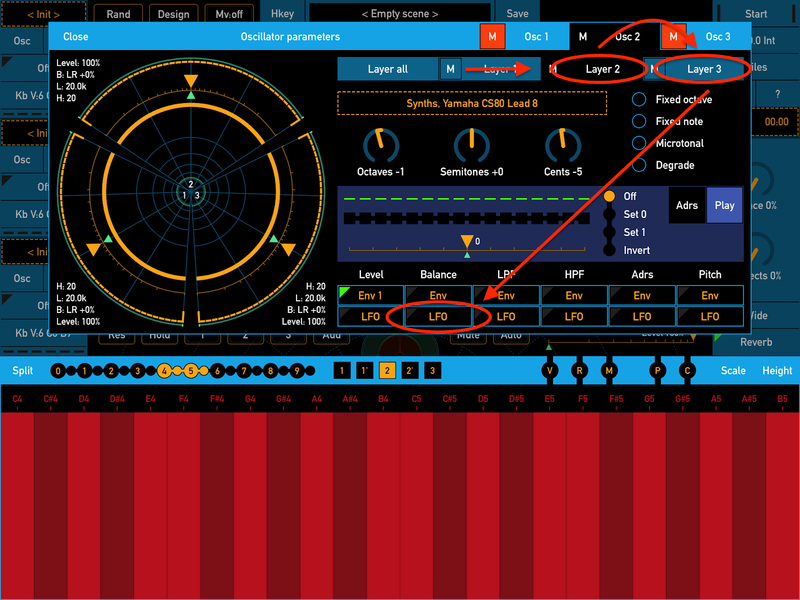 Sync with Ableton Link, Inter-App audio and MIDI. Select sequences from other scenes (if they defined). Record sequence from virtual or MIDI keyboards. Mode when keyboard starts and shifts sequence. Mode "All" to set params for all sequencers at once. Button "Rand" on main screen generate new scene. Access files thru iOS 11 Files app. FieldScaper is an advanced field recorder combined with a sound warp engine and a collection of ready to use dynamic presets for iPad and iPhone. Discover new ways to create and construct unusual and exciting sounds from any environmental audio recordings or samples recorded from other apps through Inter-App audio or Audiobus.